It is funny how researching lists can send you off in other directions. Here is a classic example. I started researching this list and when I looked up information about the upcoming Venus transit, I realized there was enough great information to do an entire list just on that topic. To see that list go here. I remember as a kid of about eight years old, discovering my love for astronomy. I read book after book on the subject and was always amazed at the depictions of the return of Halley’s comet in 1910 when it gave a spectacular show in the night sky for weeks on end. When I read that Halley’s comet would return in 86 years, I thought to myself, wow! Will I still be alive when it returns? I did some quick math and determined that, yes, in the year 1986 I would be 27 years old when Haley’s comet returned. Could I live to the ripe old age of 27? I could not even imagine a time so far in the future, but I hope I would live long enough to see it. And I did. Unfortunately, when Halley’s comet came back in 1986 it was best situated for viewing in the southern hemisphere. We here in the north got to see it, but it was pretty puny and unspectacular, to put it mildly. In fact, I only got one good look at it in 1986, through a telescope a man was kind enough to let me look through. All of my life I have read about new voyages of discovery into the universe – the Viking missions to Mars, the Voyager missions to the outer planets. I would do the same thing, calculate how old I would be to make it until the craft arrived at their far off destinations. The vast distances of the universe make any kind of travel something that takes many months, years, or even decades. So in an average human life span, one is only going to get to live long enough to witness the discoveries made by so many missions, or witness so many astronomical events. Here is a list of ten upcoming astronomical events that hopefully, we will all live to see. Some are coming very soon (months, others will not happen for many, many years). But they are all worth living, and waiting for. The first event is one I hope all Listverse readers will be around to see. And an incredibly rare astronomical event it is, something that can only be witnessed once or twice in a lifetime, if you are lucky to be born at the right time. 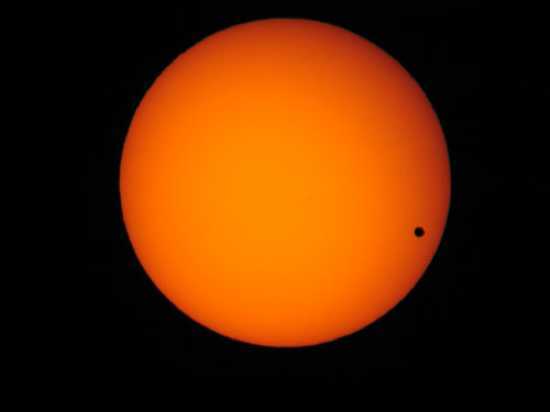 The transit of Venus in front of our Sun will be visible on June 5-6 of this year. For detailed information on the Venus transit go here. Not nearly as rare as Venus transits of the Sun (nor as easy to see from Earth because Mercury is so small and further away from us) are Mercury transits. The Mercury transits are more frequent as Mercury is closer to the Sun and orbits the Sun more rapidly. 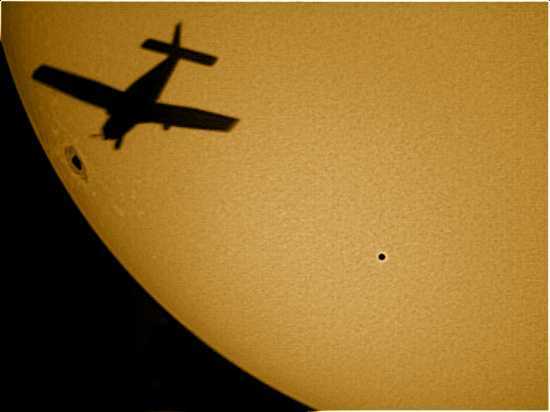 Like the Venus transit, from Earth, the viewer will see a small black dot (Mercury) pass from more or less right to left in front of the face of the Sun. Mercury transits occur within a few days either side of May 8 and November 10. The next transit is in 2016. The full transit will be visible in western parts of Europe and Africa and eastern parts of North and South America. Transits of Mercury are gradually drifting later in the year; before 1585 they occurred in April and October. The year 2015 is going to be an exciting year for astronomy buffs. The year kicks off with a total solar eclipse, which will take place on March 20, 2015. This eclipse will be seen in the center of the North Atlantic Ocean, and move past Greenland before ending in northern Siberia. The best place to view the eclipse will be in the Norwegian Sea, east of Iceland, north of England, and west of Norway. That’s right, on a boat in the “always pleasant at that time of the year” North Sea! Neither a great place to view an eclipse, nor a place likely to have clear skies, but you gotta play the hand that’s dealt ya by space. This will be followed on April 4 of that year with a total lunar eclipse visible in North America, South America, East Asia, and Australia. July 14 has the New Horizons spacecraft coming to its closest approach to Pluto. Then on September 13 a partial solar eclipse will be visible in parts of Africa, Madagascar, and Antarctica. September 28 sends us our second total lunar eclipse of the year, which will be visible in most of North and South America, Africa, Europe and west Asia. October 11 has the planet Uranus at opposition – its closest approach to the Sun. You still need a good telescope to see it, but the face of the planet will be fully illuminated by the Sun making for the best viewing. The year ends with three great conjunctions. Conjunctions are when astronomical bodies appear in the sky very close to one another. They are easy to observe with the naked eye. The first is on October 26, a conjunction of Venus and Jupiter in the early morning east sky. On October 28, Mars gets into the conjunction function mood and joins Venus and Jupiter to form a triple conjunction. They will appear as a tight triangle in the early morning eastern sky. Finally on December 7 the planet Venus will be in conjunction with the crescent moon, again, in the early morning eastern sky. 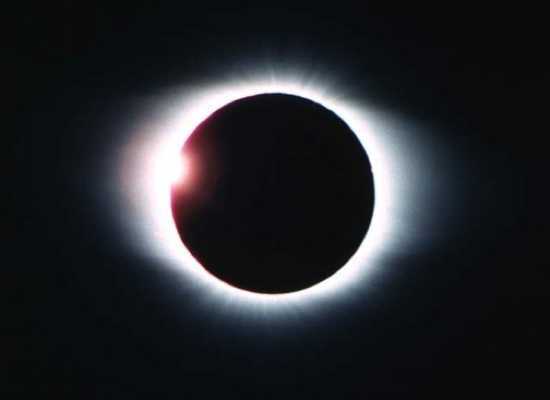 Another total solar eclipse occurs very early in 2016 – on March 9, 2016. This will afford viewers a much more comfortable setting – the south Pacific Ocean and parts of Indonesia, Sumatra, Borneo and the islands of Sulawesi and Halmahera. Comets are thought to be left over remnants of when the universe was created. Scientists want to closely study comets to learn more about them and possibly how the universe started. Therefore, they are eagerly awaiting the Rosetta mission because it is literally a chase to catch, land on, and ride along with a comet as it enters our solar system. This is something that has never been done before. Other spacecraft have been to comets, but none have landed softly on the comet and hitched a ride. Rosetta aims to do just that. The craft is on a ten-year mission to catch the comet “67P/Churyumov-Gerasimenko” (C-G), safely land on it, and come along as the comet enters the solar systems and heats up as it approaches the sun (creating the long tail given off by many comets that are sometimes observed here on Earth). This is a joint space mission between the European Space Agency and NASA. Launched in 2004 Rosetta has already visited an asteroid. On July 10, 2010, Rosetta flew within 3000 kilometers of asteroid Lutetia and closely studied this asteroid with its scientific instruments. Rosetta is now cruising through some of the deepest parts of our solar system, almost a billion kilometers from the Sun. At that distance the solar panels generate little energy so the craft is in hibernation until January 2014 when comet CG comes hurtling by as it starts its return orbit towards the Sun. The spacecraft will then fire its engines, approach the comet and literally harpoon it to place the robot called Philae on the surface. Philae will transmit scientific data back to Earth as comet CG comes into the solar system and again, approaches our Sun. Thanks to the Voyager and Galileo missions to Jupiter, we now have a much better understanding of this, the largest planet in our solar system. These missions have closely studied the moons of Jupiter, its ring, and other important objectives. What scientists wish to do with the Juno mission to Jupiter is determine how Jupiter came into existence, and how it has evolved into the giant gas planet it is today. The Juno mission will measure how much water is in the planets atmosphere and will peer deep into its clouds to determine temperature, composition, cloud motions and patterns, etc. It will study the massive planets powerful magnetic and gravity fields and closely study the north and south poles where Jupiter has its own version of auroras. By doing so, Juno will help scientists understand more about how the solar system was created as Jupiter is thought to be our “second sun” that never ignited. Juno will give scientist a better understanding of why the gas giant planets (Saturn, Uranus, Neptune and Jupiter) formed and exist compared to the rocky, inner solar system planets like Earth and Mars. Juno was launched August 5, 2011 (my father would have turned 80 years old that day), and will arrive at Jupiter in July 2016. It will orbit and study the planet for about one year. 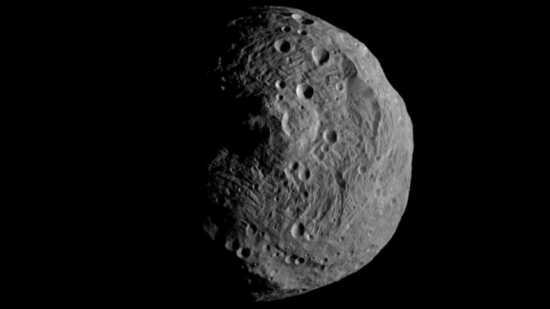 The first mission to visit and orbit the two largest objects in the asteroid belt (located between the orbit of Mars and Jupiter), the spacecraft Dawn has already been to the first object – the asteroid Vesta (above). 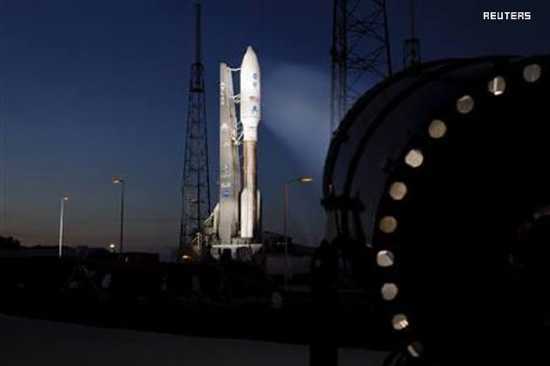 Launched in 2007, Dawn arrived at Vesta on July 16, 2011 and will continue to orbit the asteroid and do science until about July of this year when it will fire its innovative ion-propulsion engine and take off for its second target, the dwarf planet Ceres. Dawn will arrive at Ceres in February 2015 and conduct science for the remainder of that year before the mission ends. Dawn was the first spacecraft to use an ion propulsion engine. Ion propulsion or ion thruster engines create thrust using accelerated ions. This type of engine uses either electrostatic ions or electromagnetic ions to very slowly generate thrust by propelling the ions out of the rear of the engine. Though the thrust generated is very small, it is highly efficient and uses minimal propellant. To work, the ion thrust engines need to be in an environment devoid of other ionized particles – space being a prime example of such an ideal environment for this type of engine. Ceres and Vesta are similar in that they are very large objects located in the asteroid belt, but are also very dissimilar in make up. As the asteroid belt objects are thought to represent what the solar system was like at its birth, a close study of these two objects is hope to reveal much about how our solar system was created. After its successful launch on Nov. 26, 2011, the Mars Science Laboratory Curiosity rover is cruising along and working well as it approaches Mars. The trip from Earth to Mars will take about 36 weeks (254 days). Once it reaches Mars orbit, the spacecraft will release the Mars exploration robot – Curiosity – which is scheduled to land on the surface of Mars on August 5-6, 2012. The Curiosity robot was designed to be even better at exploring the surface of Mars than the highly successful Mars Exploration Robots. (one of which, “Opportunity” is still going and doing science, 8 years later!). The scientific instruments aboard the Mars Science Laboratory will attempt to answer the question – has Mars had an environment that, in the past, or today, supported life? In other words, has Mars ever been, and might it still be today – habitable? To haul around so many scientific instruments, the rover is the largest ever sent to a planet (over 2,000 pounds and about the size of a small car). Therefore, landing such a massive craft, delicately so as not to damage it, on the surface of a distant planet, presented new challenges. The Opportunity and Spirit rovers landed on Mars using air-bag technology – essentially the robots were incased in giant air bags that hit and bounced along the surface of Mars until they came to rest. The air bags then deflated and the robots came out, unharmed. 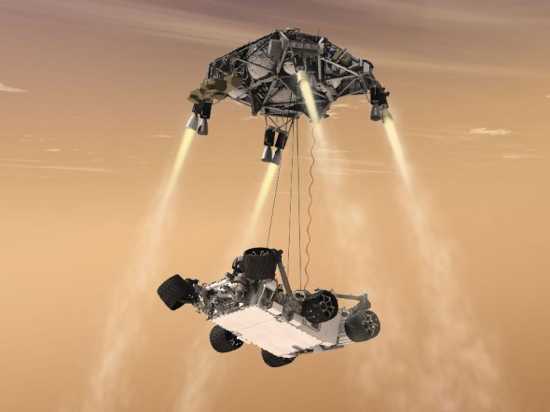 This will not work for Curiosity so it will use a new method of landing on the planet called a “sky crane.” Curiosity will descend to the planet using rockets to slow its approach, and then a parachute, like previous missions. It will then use more rockets to slow the craft down and hover above the surface where the sky crane will lower the craft on a tether – gently placing it on the surface. This method of landing also allows for greater precision of where scientists want to place the robot. Using the air bag bounce technology, the Opportunity and Spirit rovers were expected to land anywhere in a zone roughly 93 by 12 miles. Using the sky crane technology, Curiosity will touch down within an expected zone of about 12 miles. This means the robot will need to travel less distance to get to targets of exploration on the surface. Also on board the Curiosity spacecraft is a Lincoln penny located next to the color calibration chart. The robot has a color calibration chart used to calibrate the spacecraft cameras to know examples of colors so as to achieve the best realization of the true colors of Mars objects. The penny is a nod to geologists’ tradition of placing a coin or other object of known scale as a size reference in close-up photographs of rocks, and it gives the public a familiar object to view on the planet. People everywhere can relate to the size of a coin, and they can watch as it moves around the surface of Mars with the robot. Will it corrode? Will it change color? Will it be scared by dust and windblown sand? Will a Martian pick it up and put it in their penny loafers? To learn more about the penny and to see it, go here (warning – may need a fast Internet connection). The James Webb Space Telescope (JWST) is the planned replacement for the highly successful and still operating Hubble Space telescope. The telescope is named after James Webb, the second NASA administrator and leading force in the Apollo space program. It will have the capability of taking visual images and infrared images. 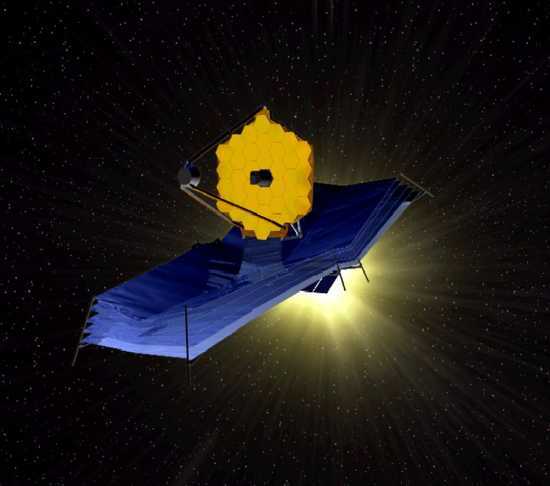 The JWST will continue the work of Hubble in looking for and viewing the most distant objects in the universe; objects too distant to be seen by Earth-based telescopes. The JWST will differ from Hubble in one very important way – it scheduled to be placed in a stationary space position at Lagrange point 2 (LG2). This would be the first large manmade object ever positioned permanently at a Lagrange point. A Lagrange point is one of five possible positions in space where a small object can be placed and, theoretically, it will not move (it will not drift off or be pulled into the orbit of a moon, planet, sun, etc.). The idea is to position the telescope in the exact specific location between the Sun and Earth, or the Earth and the Moon, so it will remain there simply by the force of gravity. The Lagrange points mark positions where the combined gravitational pull of the two large masses provides precisely the centripetal force required to rotate with them. Positioning the JWST at LP2 would mean it would be far away from the Earth and any interferences from our planet, especially orbital space junk. However it would also mean a much further journey for astronauts to go to it and do service and repair visits. Congress was about to cut funding for the continuation of the JWST project in 2011, but reversed course. The project is still funded and for now, parts of the telescope are being made. Someday, hopefully soon, the JWST will be in space and taking even better and more amazing pictures of deep space than even the Hubble space telescope was able to achieve. Back in the 1960s scientists realized a unique opportunity for space exploration would occur in the 1970s when the four large gas giant planets (Jupiter, Saturn, Uranus, Neptune) would line up in such a way that a spacecraft launched from Earth could visit all four, one after another. Such alignments are very rare and to take advantage of it the US launched Voyager 1 and Voyager 2 in 1977. Both spacecraft visited Jupiter and then flew onto Saturn. 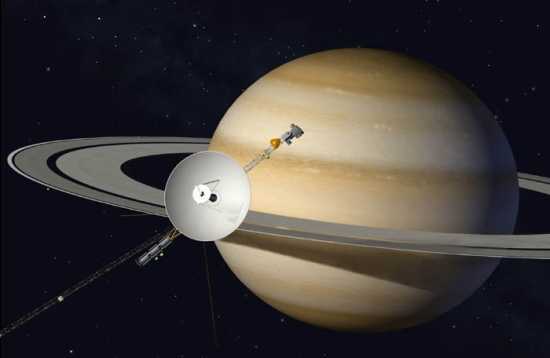 To gain a close look at Saturn’s moon Titan (which was the only moon at that time known to have its own atmosphere), the trajectory of Voyager 1 was set so that it would not swing past Uranus and Neptune and instead, after leaving Saturn, went on in a direction out of the ecliptic to take it out of the solar system. Voyager 2 carried on the mission and made the historic first encounters with Uranus and then Neptune. Both spacecraft continue to function and are thus positioned to answer some of the most basic questions about our solar system – where does our solar system end and where does “outer space” (the area beyond which our Sun has no measurable impact) begin? If all goes well, we may have the answers to those questions within a matter of years. In 1998 Voyager 1 overtook the spacecraft Pioneer 10 and became the most distant manmade object ever sent from Earth. Because it is traveling much faster than Pioneer 10, it will remain so unless it collides with something in space. As of the beginning of February 2012, Voyager 1 is 180,000,000,000 kilometers from Earth moving along at a speed of about 32,000 miles per hour. It is moving about 10% faster than Voyager 2. But even at that speed, it will take another 73,600 years to come anywhere near another star (Proxima Centauri). Voyager 1 is not heading in any particular direction, but in about 40,000 years it will pass within about 100,000,000 miles of the star AC+79 3888. The Sun has a measurable impact on deep space well beyond the orbits of the planets because of the solar wind – a push of radiation and charged particles given off by the sun and fanning out in all directions like ripples on a pond from a stone. This is the heliosphere. But there is a limit to how far the solar wind can go before it is met by and neutralized by the stellar winds of surrounding space. This is the point the Voyager spacecrafts are looking for. No one knows where this point, called the heliopause, is located. Voyager is expected to reach the heliopause in 2012-2015 and will measure the termination zone if its instruments continue to function (scientists believe they will hold out until about 2025). But Voyager has already passed two early and important areas. In 2004 Voyager passed the termination shock – the point in the heliosphere where the solar wind slows down to subsonic speed (relative to other stars) because of interactions with the local interstellar medium. 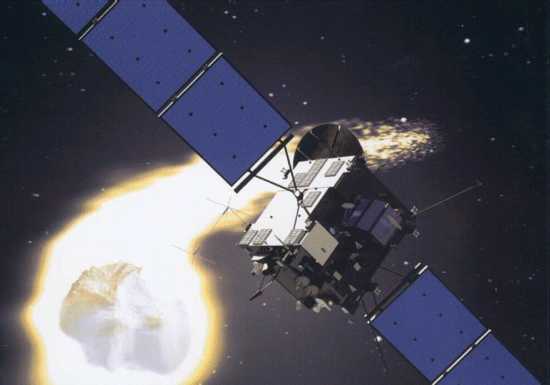 After the termination shock, the Voyager spacecraft entered the heliosheath – an area of turbulent interaction between the Sun and outer space where each tries to gain the upper hand. Voyager has already made some amazing and startling discoveries about this unknown area of space. Someday, perhaps in months, perhaps in a couple of years, one of the Voyager spacecraft, probably Voyager 1, will leave the heliosheath, pass through the heliopause, and become the first object sent from Earth to become truly an interstellar spacecraft. I put this event as my #1 choice for personal reasons – it is my most anticipated. Why? Because in my lifetime we have successfully visited, photographed, and conducted science at every planet in our solar system, including other solar system objects such as comets, asteroids, and the Sun itself. We have visited everything but the planet Pluto. Also, when I was ten years old, I read the book “The Search for Planet X” describing the discovery of Pluto by Clyde Tombaugh. I have been fascinated with planetary exploration and Pluto ever since. To commemorate the discovery of Pluto, one ounce of the ashes of Clyde Tombaugh are aboard the spacecraft, while one of the science packages (a dust counter) is named after Venetia Burney, who as a child suggested the name Pluto after its discovery. As many people know, scientists recently down graded Pluto from full planet status to “minor planet.” This seems odd to me as we know Pluto has several moons, an atmosphere, and possibly rings like Saturn. How can that not be a planet? You have me. Anyway, I look forward to the New Horizons mission because it will complete mankind’s first full reconnaissance of our solar system, checking out our own “backyard” of space as it were. This is an historical achievement of man, something all of us can and should be proud of. And we did it in just about 50 years. Launched in 2006, New Horizons has already journeyed 2 billion miles and still has about 1 billion miles to go. But the New Horizons spacecraft is past the mid-point of its journey to Pluto; it has passed the orbit of Uranus and is in the home stretch (a very long home stretch). How far is New Horizons from the Earth? Light from Earth takes 3 hours to reach the craft, so communication from Earth to new Horizons and back to Earth presently takes over 6 hours. It will arrive at Pluto around July 14, 2015. If you were aboard New Horizons as a passenger and looked out the rear view window back at the Sun and planets where you came from, what would you see? To see an artist depiction of this, go here. New Horizons is the fastest object man has ever made, it travels at 34,000 miles per hour and covers a million miles of space in one day. At its present speed it could go from the Earth to the moon in the time it takes to fly from the east to the west coast of America, about 5 hours. 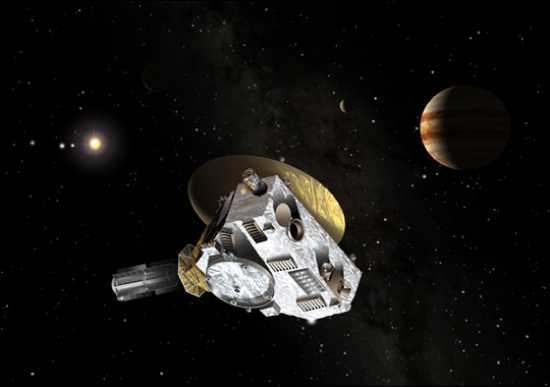 What will New Horizons see when it gets to Pluto? An artist depicted what our Sun will look like to an observer standing on the planet. You can see the video here (warning – you will need a fast Internet connection). After it flies by Pluto and its moons, the spacecraft will journey on into the Kuiper Belt – an area at the deepest part of our solar system where asteroids and comets abound and occasionally get pulled by the gravity of the Sun in towards the planets. When this happens, the comets or asteroids can impact the Earth or other planets, or get sucked into the Sun. To see this happening in an amazing video that captured a comet plunging into the Sun, go here (warning – you will need a fast Internet connection). Like the Voyager spacecraft, after New Horizons passes through the Kuiper Belt, it will continue on until it reaches outer space. OK, so we won’t be around to see this one. But it would be very cool if we were. Betelgeuse is a well-known star to even casual viewers of the night sky because of its size, color, and placement. Betelgeuse is the eight brightest star in the night sky and is easy to locate as it is the second brightest star in the constellation of Orion. If you can find Orion’s belt, Betelgeuse is the reddish star in the constellation. It is a red supergiant star and one of the largest and most luminous stars we know of. Betelgeuse is so huge that if it were our Sun, the outer edges would stretch out to the orbit of Jupiter. It is about 640 light years from our Sun. Astronomers believe Betelgeuse is a young star but because it is so massive, it is a “runaway star” heading for extinction. It is expected to go super nova in less than one million years. Therefore, at its current distance from Earth, the Betelgeuse super nova explosion would be the brightest ever recorded in Earth’s history. As viewed from Earth, the Betelgeuse super nova would be brighter than the moon and would easily be visible in the daytime sky for several months. I’d love to be around to see that!